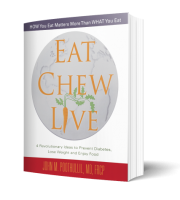 Eat Chew Live is for people who are concerned about their eating habits, are gaining weight, or who are worried about getting or who have diabetes. There is a growing segment of the world’s population who have high blood sugar or Type 2 diabetes. These conditions are fast becoming the top health problems in the US. Diabetes is at nearly pandemic levels, with 1 in 4 adults over 65 in the US being fully diabetic and 1 in 3 over age 20 being prediabetic. In Eat, Chew, Live, Dr. John Poothullil argues that it is time to reevaluate the accepted theory of insulin resistance as the cause of the disease since medical research still has yet to explain how it happens or why. In its place, he has discovered a far more logical scientific explanation for high blood sugar and diabetes. begins occurring regularly when people overeat carbohydrates and fill up their fat cells, causing fatty acids to flow freely in the bloodstream and be used as fuel for muscle cells. Called the “fatty acid burn switch,” it leaves glucose in the bloodstream, leading to high blood sugar and eventually to the diagnosis of diabetes. With clear explanations and dozens of illustrations of the science involved, Eat, Chew, Live presents three additional revolutionary ideas that will help millions of people learn to prevent diabetes and even reverse it. The brain ensures our survivability by monitoring our nutrient intake. We can learn to listen better to the brain’s signals about hunger and satiation. We each have an “authentic weight” that we intuitively know as healthy for our bodies. Returning to that weight is more difficult as we age because exercise and diet programs seldom work for adults. The key is to reduce consumption. To change our eating habits, we must learn to eat mindfully, being more aware of chewing and tasting what we eat so that the brain can register the incoming nutrients. Through Dr. John Poothullil’s help and putting into practice EAT CHEW LIVE, I have lost over 100 pounds. It has given me hope there is another way to care for diabetes, think about food, and eat.